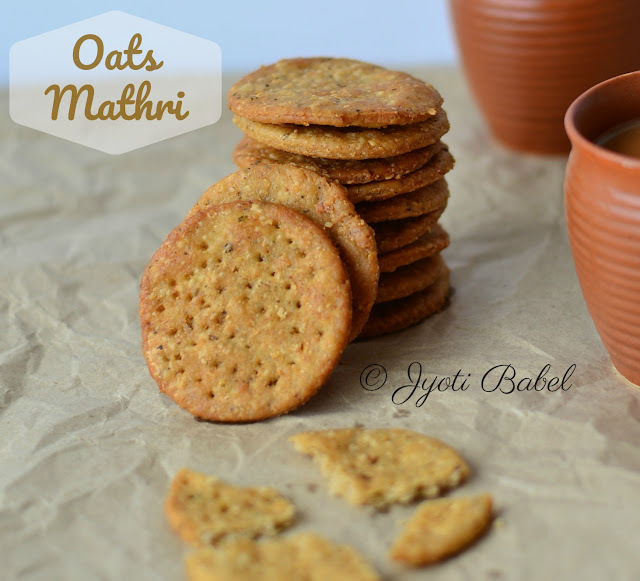 These Oats Mathri are a close cousin of the regular mathri. Mathri is an ever popular deep fried snack that goes well with Indian masala chai. While it is generally prepared with maida/all purpose flour, I decided to make a somewhat healthier version by using oats flour and wheat flour. After posting sweet dish recipes one after the other here it's time I share something savoury. So, for the 3rd day of my special day/festival theme in blogging marathon, I am sharing a recipe for these oats mathri. Along with sweets, savoury snacks also have their rightful space in the menu during festivals – be it Diwali or Holi you cannot do without munching on a handful of them. In a mixing bowl add all the ingredients and using water little by little knead a firm dough. Cover and set aside for 15 minutes. Divide the dough into 4 balls. Roll each dough balls 1/8 inch thick and using a cookie cutter cut out circles of the dough. Poke a couple of holes in them and transfer the circles to a clean plate. Repeat the process with the rest of the dough. Heat oil in a pan for deep-frying. When the oil is hot enough deep fry mathri in batches in hot oil turning them in between. They are done when they are light brown in colour on both sides. Transfer them on a kitchen towel so that excess oil is soaked out. Once they are cooled store in airtight container. 1. I churned rolled oats to get oats flour. 2. Poking holes in the rolled circles ensure that mathri will not puff up like a puri when deep fried. 3. Keeps well for 2 weeks when stored properly in an airtight container. 4. The dough should be firm. A soft dough will not yield crisp mathri. These mathris look so delicious and its with more oat flour than wheat. Wonderful recipe. Guilt free munching snack. Great way to include oats flour. Thanks for sharing. Never tries oats in mathri before. Such a guilt free snack to munch on. I love baking with oat flour - these look fabulous! I've never tried making mathri at home. Yours looks so good. a perfect snack with evening tea/coffee! never tried adding oats though, will remember when making it next time!